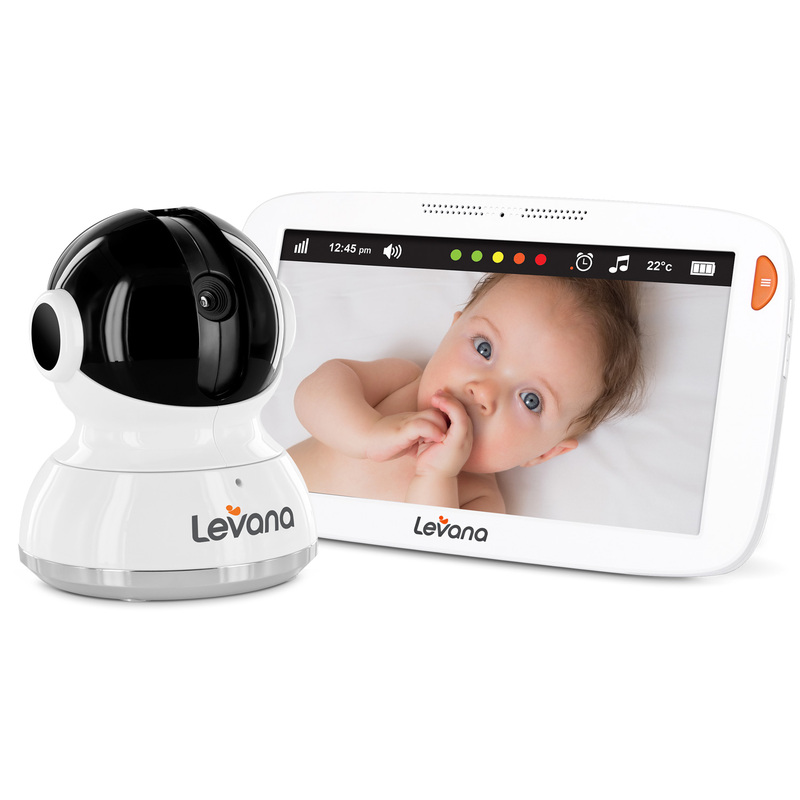 Introducing Aria with Pan/Tilt/Zoom, Levana’s most intuitive baby monitor. It features a 7” touch screen. Aria will quickly become part of your family with 12 hour battery life, temperature sensors, feeding timers, lullabies and an easy to use icon based menu. There’s lots to love about Aria’s large and luminous touch screen. Incredible image quality and a front facing speaker lets you feel as close as possible without waking baby up. The sturdy and resilient steel monitor stand allows you to view from any angle and reposition easily. Having a large screen no longer means compromising battery life. Aria offers you up to 12 hours of battery life in Power Save Mode. We know how important it is to know your baby is sleeping peacefully. You can shut off the screen until baby makes a peep and triggers the screen to turn on. Experience a full charge in 4 hours with rapid re-charging technology. View two of your little ones side by side with perfect split screen view. We’ve also included a camera wedge, so you can get the angle just right. You can add up to 4 cameras to Aria and see all your children at once. Mix and match with fixed or Pan/Tilt/Zoom cameras for your most realistic viewing experience. This system is compatible with 32206 and 32205 cameras. The sleek profile of this monitor features completely redesigned 16mm monitor housing with front facing speaker. Aria fits comfortably in the palm of your hand. Encrypted digital proprietary signal and channel hopping ensure that your connection remains private. Aria features 500ft transmission range, so you can check in from anywhere in your house or yard. See every detail with our silent camera that allows you to pan 300⁰ and tilt 110⁰. When you find what you’re looking for, zoom in with 2x magnification and keep a close eye on baby. Aria lets you check in on the whole room, without making a sound. Invisible infrared LEDs provide a clear image of your child in the dark up to 12ft away. Rest assured knowing you can see your baby clearly, even when it’s lights out. Our intuitive touch screen responds to your quickest and most feather-light commands. Navigate effortlessly through the menu, select one of Aria’s many features and customize it specifically for your baby. We’ve included on screen instructions, help and FAQ’s right in the menu system to help you out or teach a first time user. We know that it’s important to you that baby’s sleeping safe and comfortably. Check the temperature in your nursery from anywhere in your home and receive audible or on screen alerts for anything outside of the temperature range you set. We know you have enough to think about, let Aria do the thinking for you. Our timer lets you choose audio or on screen alerts when it’s time to feed your baby or put them down for nap. It will even remind you if your last feeding was on the left or right. The Aria monitor features three classic lullabies, soothing white noise and dynamic nature sounds. Set customizable timers that turn the music off automatically so you can rest too.